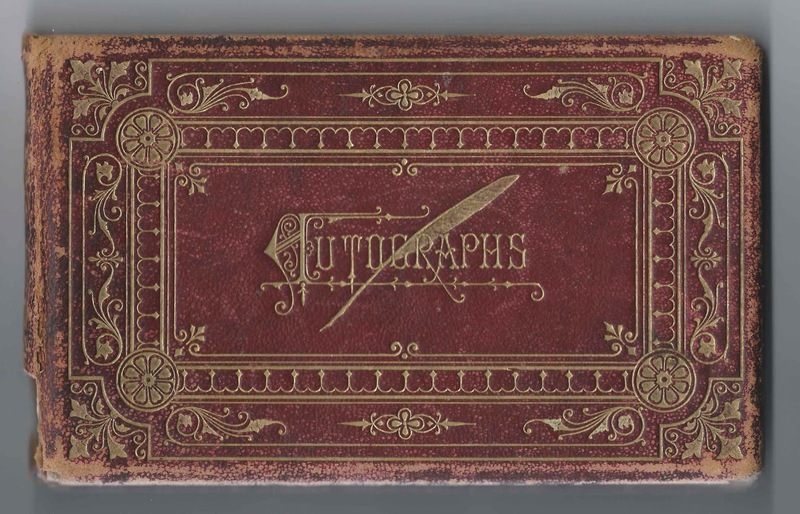 1873-1880 autograph album of Mary Ella Coburn of Chelsea, Massachusetts, presumably a graduate of Chelsea High School in the Class of 1873. 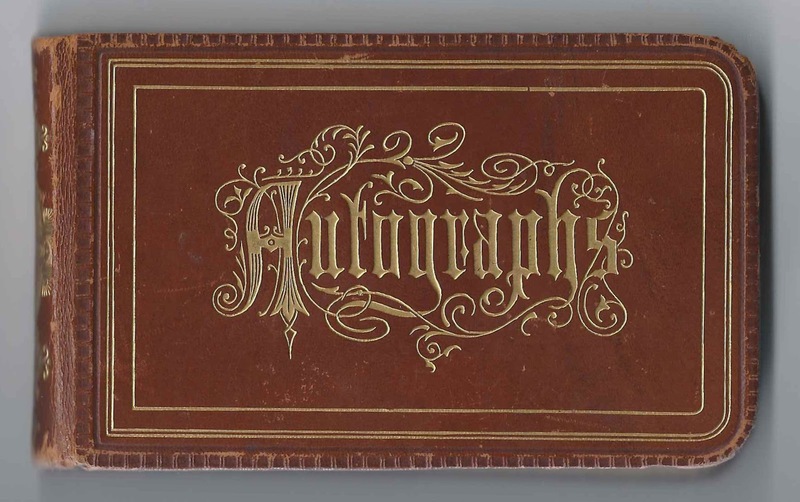 The album measures approximately 7" x 4-1/4" and contains the sentiments of over 40 of Mary Ella's relatives, schoolmates and friends. 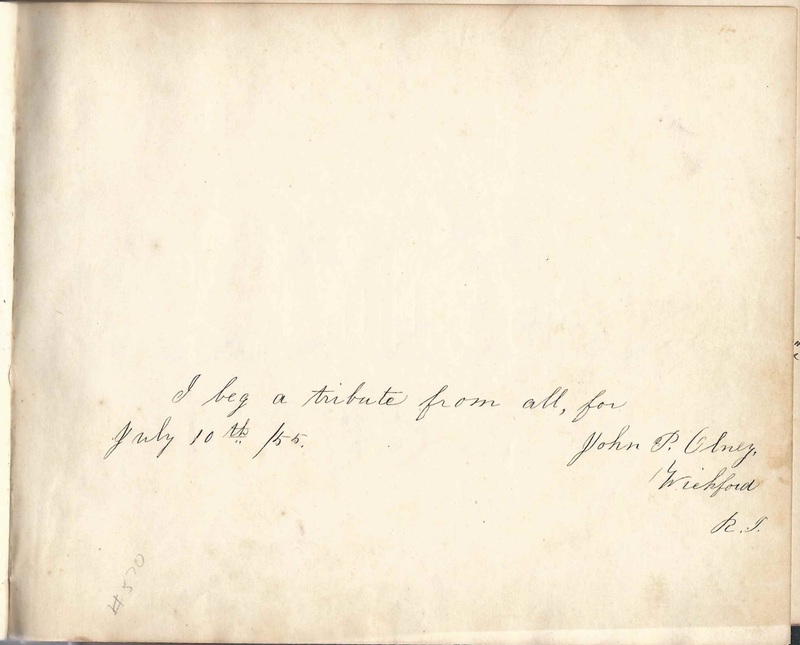 An alphabetical list of the signers, with any residence and school information, appears at the end of this post. 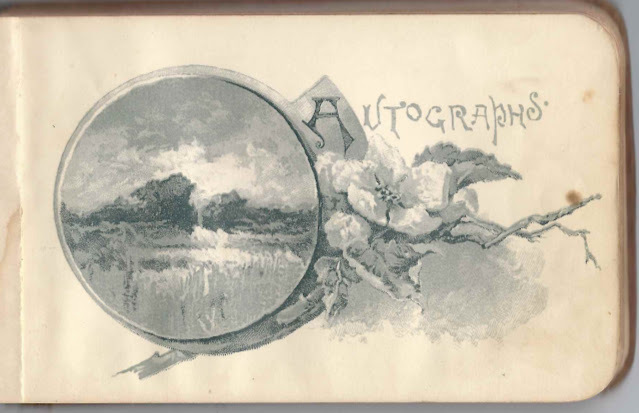 Mary Ella Coburn was born 14 February 1854 at Boston, Massachusetts, the daughter of Henry Reed Coburn and Eliza (Fosdick) Coburn, who were born at Fort Hill in Boston, Massachusetts, and Pennsylvania, respectively. 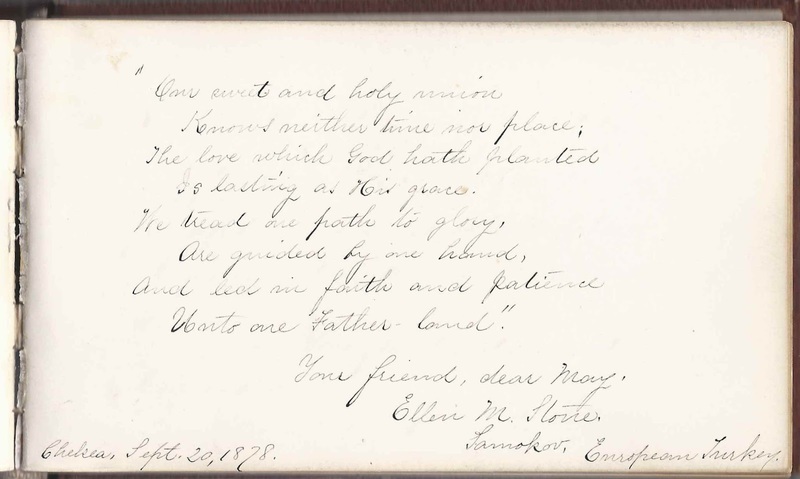 Two of Mary Ella's brothers inscribed pages in her album. 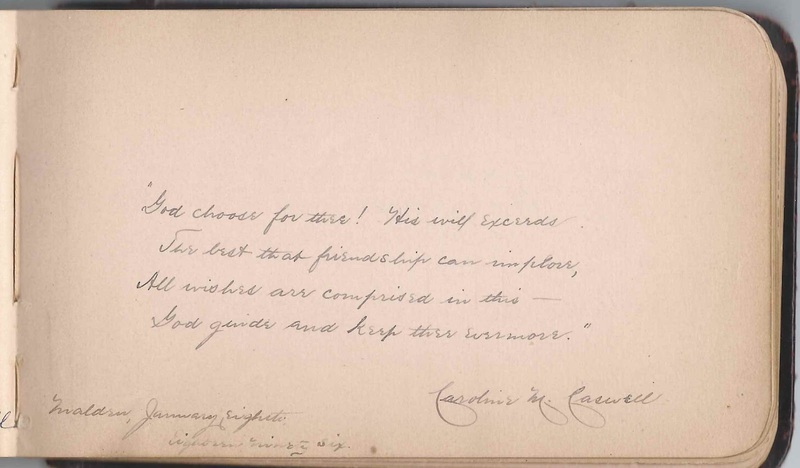 Her oldest sibling George H. Coburn signed a page. 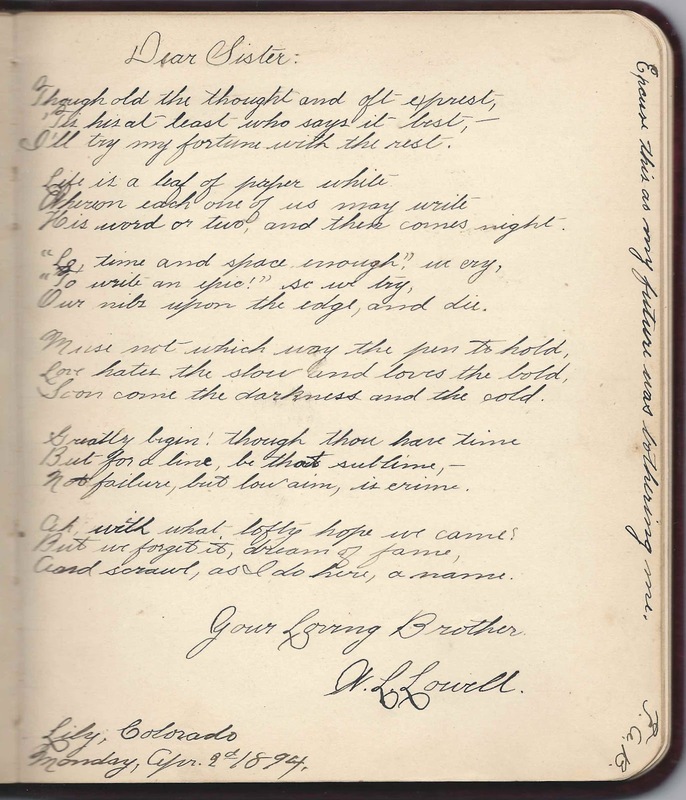 Her brother Frank Forrester Coburn's name appears in tiny handwriting at the margin of a page near the end of the album. It's possible that someone else wrote his name. 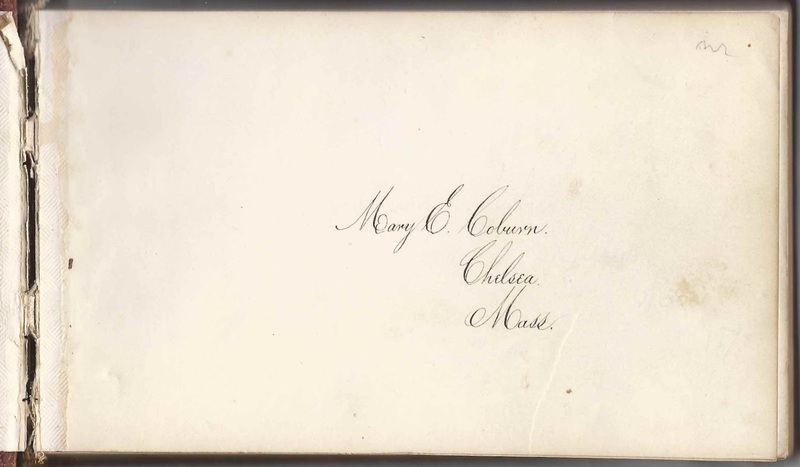 Mary Ella's older sister Emma Jane (Coburn) Brolaski had died before Mary Ella started her album. 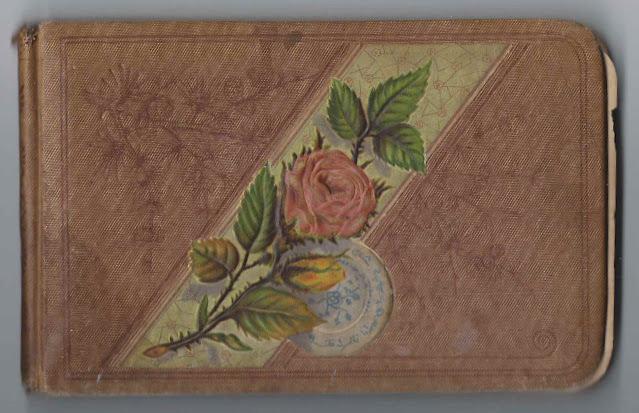 Emma Jane had married John B. Brolaski on 6 February 1866. Their daughter Cora M. Brolaski, who was born in Missouri about 1867 inscribed a page in her aunt Mary Ella's album on September 19, 1878. Either she was visiting family in Massachusetts, or Mary Ella was visiting St. Louis, Missouri. 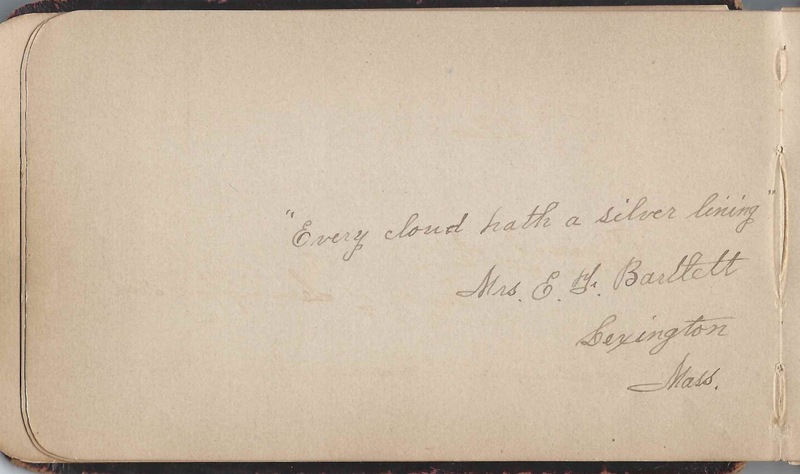 From the many signers who noted that they were members of the Class of 1873 at Chelsea High School, I'm assuming that Mary Ella Coburn was also in that class. Whether Mary Ella went on to pursue higher education or not, I don't know, but the 1880 Census of Chelsea, Massachusetts, shows her living with her parents Henry and Eliza and not employed. 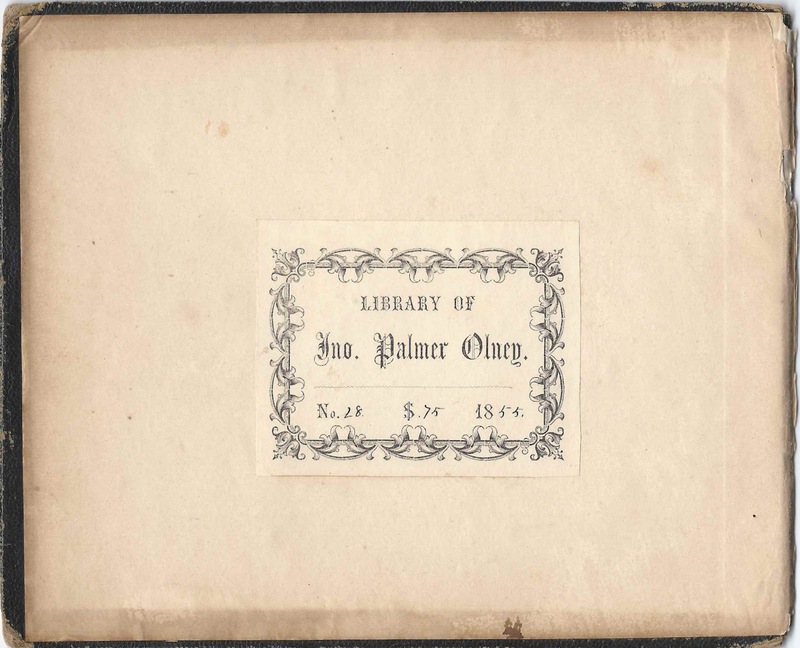 Not that she necessarily needed to work, as her father, while in Louisville, Kentucky about 1840, had discovered a way to extract oil from lard and then returned to Massachusetts to build a factory at Chelsea that proved very profitable. 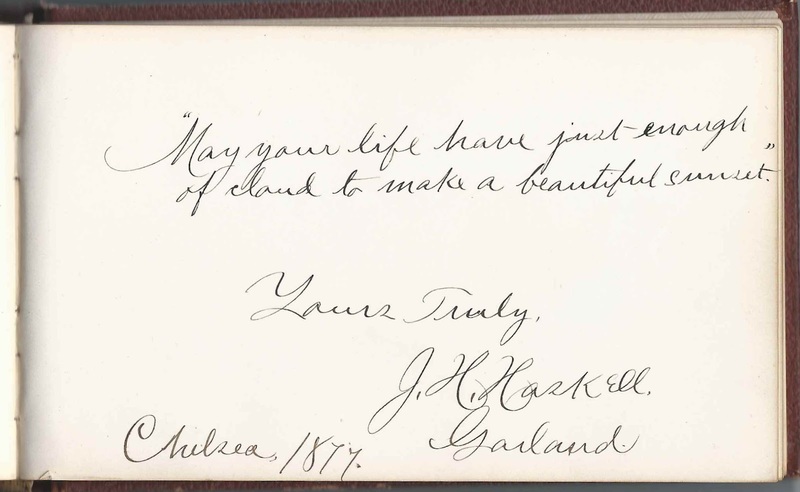 Mary Ella was working as a music teacher when she married John H. Haskell on 27 April 1887 at Chelsea, Massachusetts. 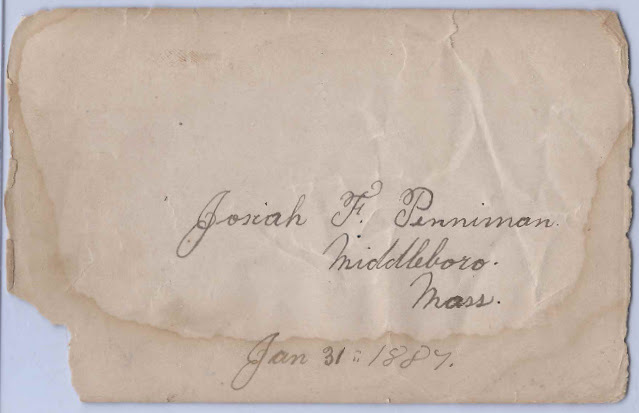 John, who gave his occupation as "collector" was born about 1854 at Garland, Maine, the son of Andrew Mayhew Haskell and , Mary Ella Coburn married , son of Andrew Mayhew Haskell and Mary B. (Sargent) Haskell. At the time of the 1910 Census of Chelsea, John H. Haskell was working as an undertaker. 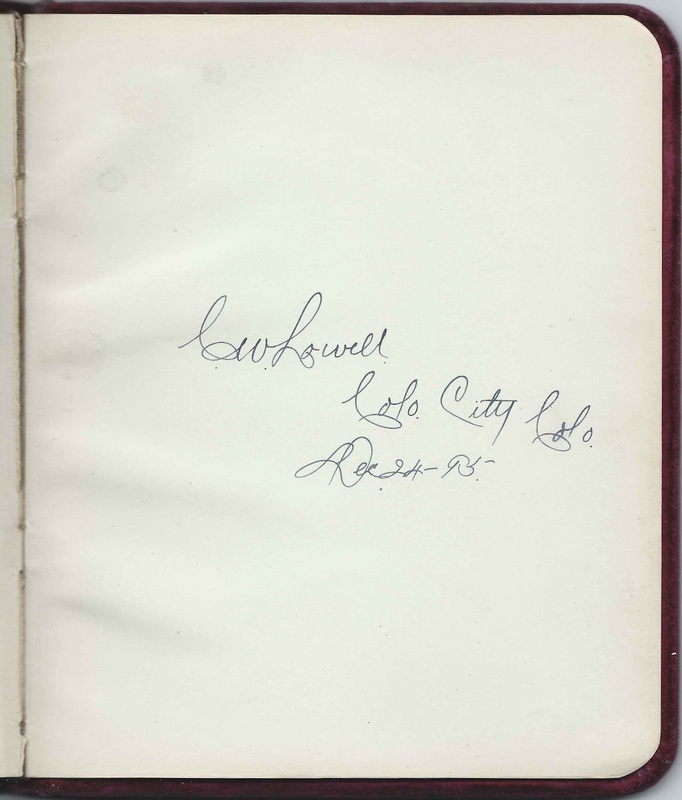 By 1920 he was working as a clerk at a wholesale automobile business. Before their marriage, at Chelsea, Massachusetts, in 1877, John H. Haskell signed a page in his future wife's album. 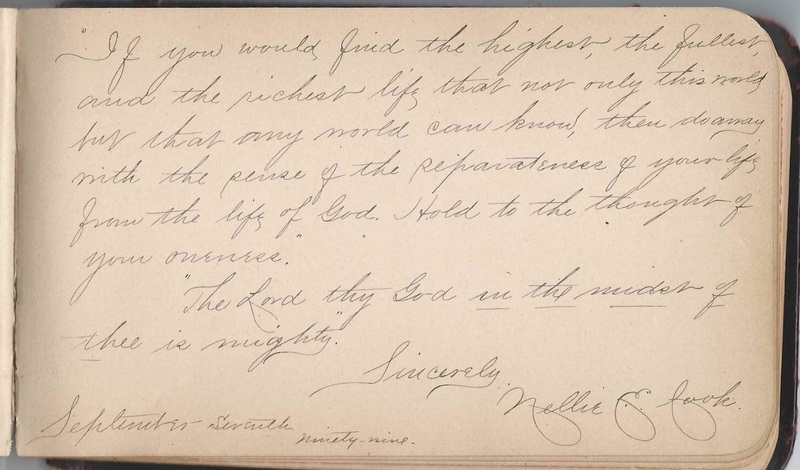 One page was signed by Ellen M. Stone, a missionary to areas in the Ottoman Empire. 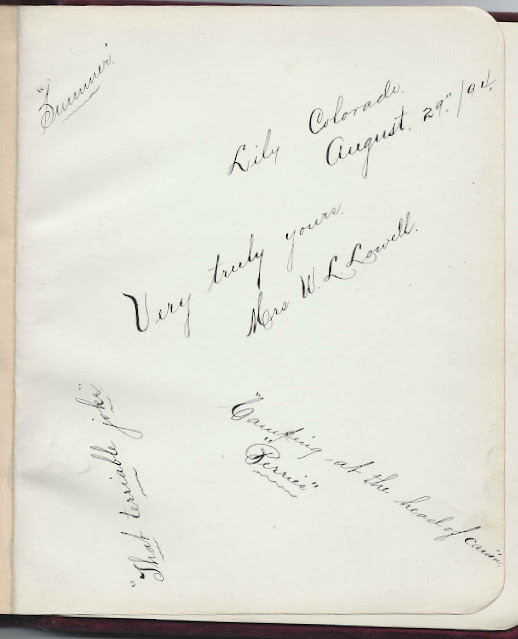 She signed her page at Samokov, "Eastern Turkey", on September 20, 1878, while she was at Chelsea, Massachusetts. In the "Miss Stone Affair", Ellen Maria Stone, who hailed from Roxbury, Massachusetts, would later be kidnapped near Bansko, Bulgaria in 1901. In what some call the first modern "hostage crisis", Ellen and her pregnant companion, were held for over five months and released only after the American public raised funds for their ransom.
? Briggs of Cleveland, Ohio. 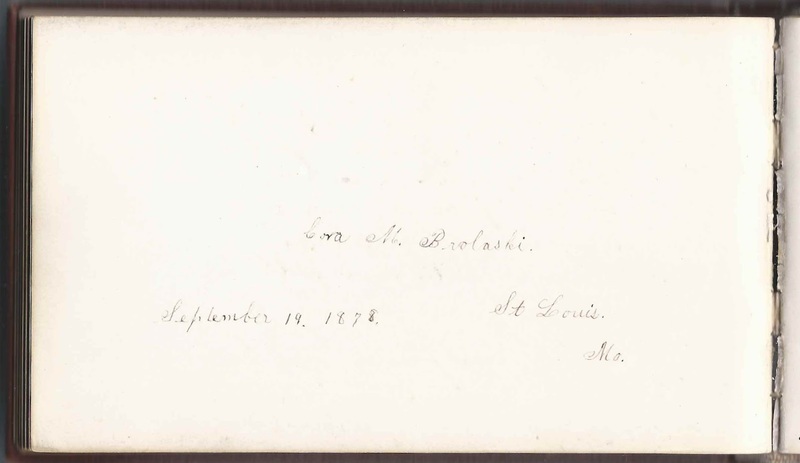 Cora M. Brolaski of St. Louis, Missouri, signed on September 19, 1878. 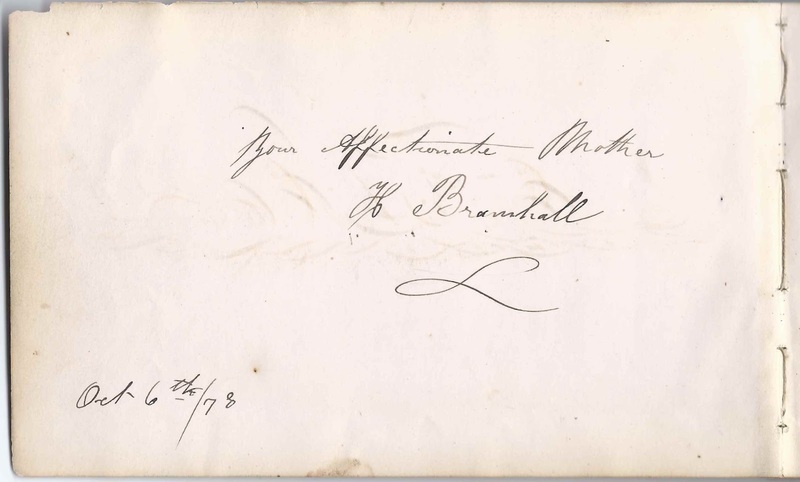 She was the daughter of Mary Ella's sister Emma Jane (Coburn) Brolaski and Joseph B. Brolaski. 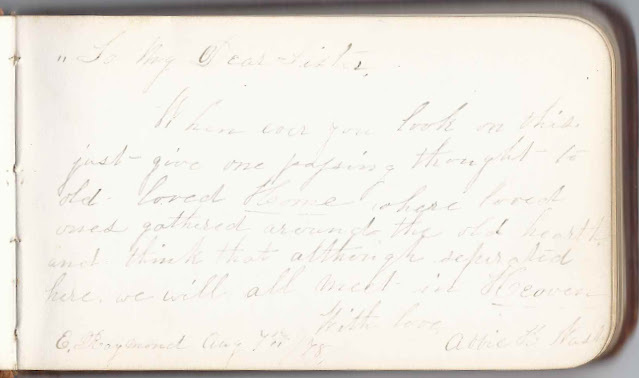 Emma died in 1872; Joseph married Emily P. Pettes in 1874 at St. Louis, Missouri. 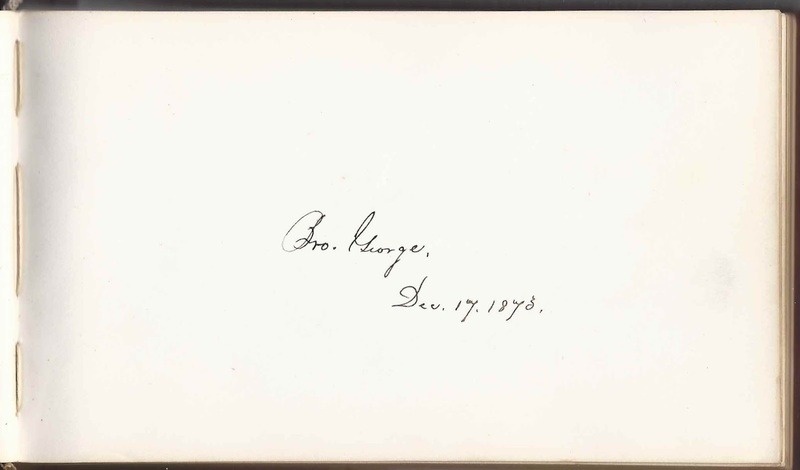 Brother George, signed on December 17, 1873. 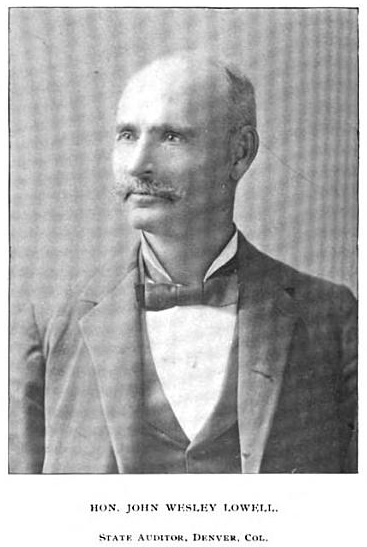 George H. Coburn, Mary Ella's oldest sibling. Frank F. Coburn. Mary Ella's older brother Frank Forrester Coburn. 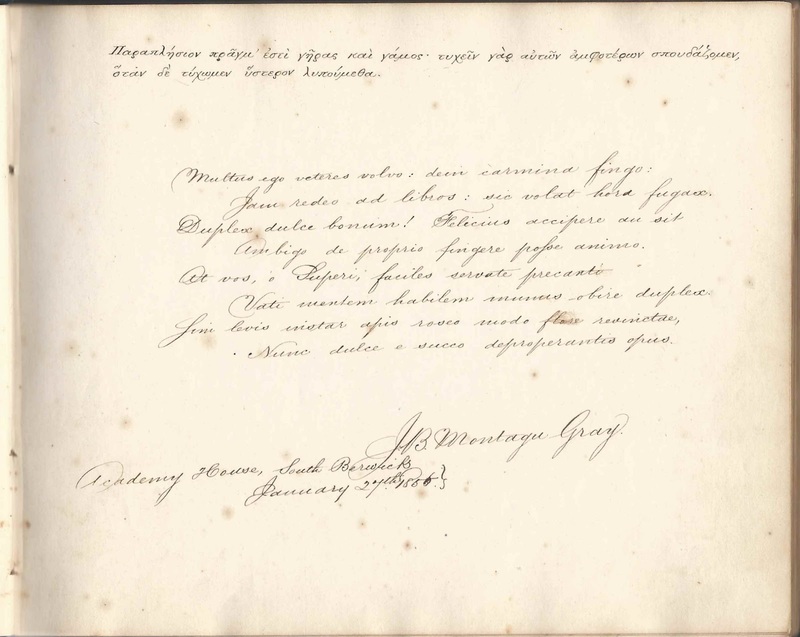 His name appears in tiny print sideways on one of the margins of a back end paper. 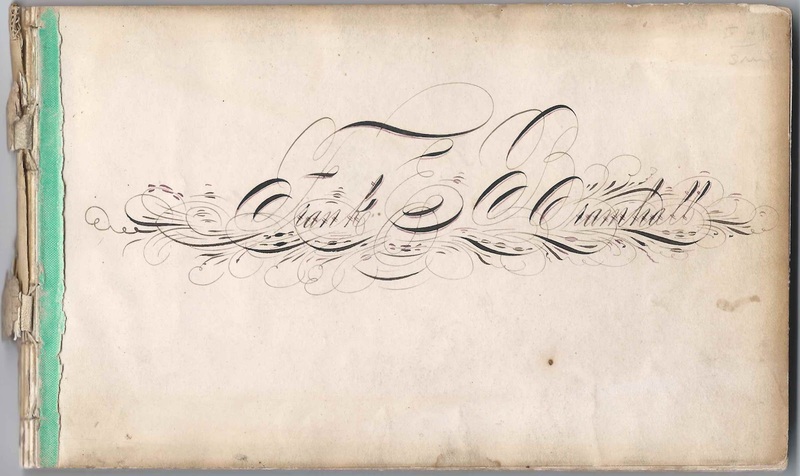 C. N. Fuller, signed at Titusville [no state written] on December 17, 1873. 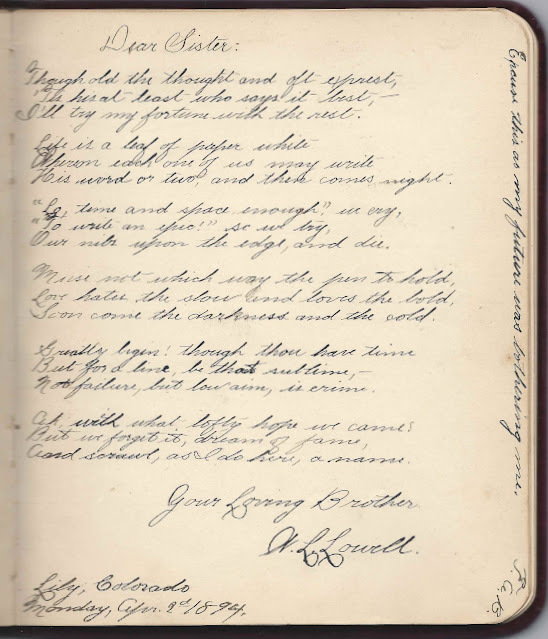 Frank A. Hill, signed on April 24, 1873; he transcribed the poem "Song of Songs" on the right facing page. Emma W. Jones, signed at Chelsea, Massachusetts, in 1875. 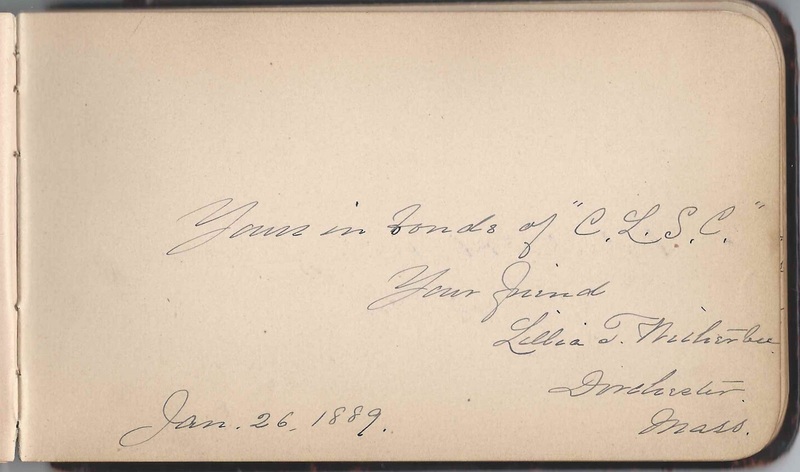 "Your South Carolina friend"
Adelia Lane, signed on May 9, 1873; the right facing page is half missing vertically, but the handwriting looks very similar to that of Adelia Lane. 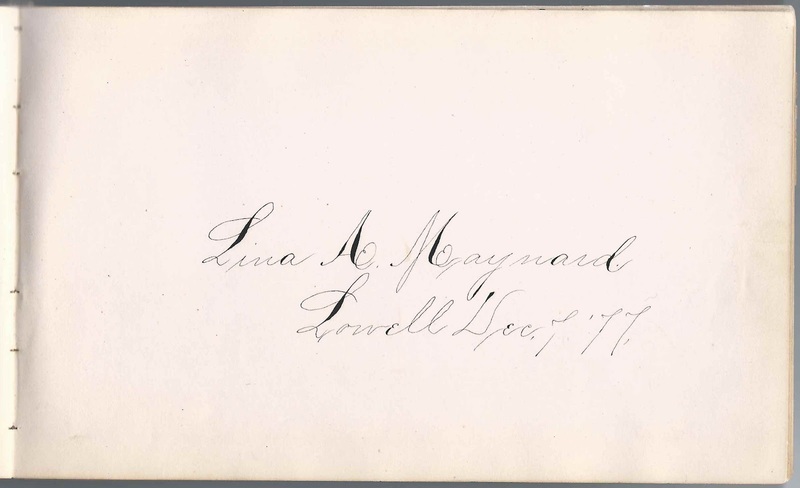 Sara P. Littlefield, signed on June 19, 1873 Middle initial hard to read but possibly H. I. M. or H. V.M. Frank M. Nottage, Chelsea High School, Class of 1873; "Thy Friend"
Etta A. Potter, signed at Boston, Massachusetts, on June 17, 1880. Could also be Ella A. Potter. A. M. Pratt of Chelsea, Massachusetts, signed on August 12, 1877. 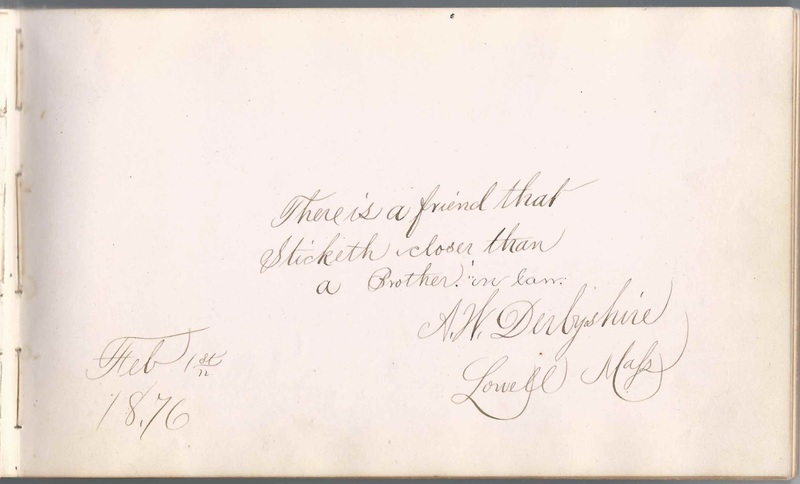 Presumably Arthur M. Pratt, brother of signer Waldo Elliott Pratt. 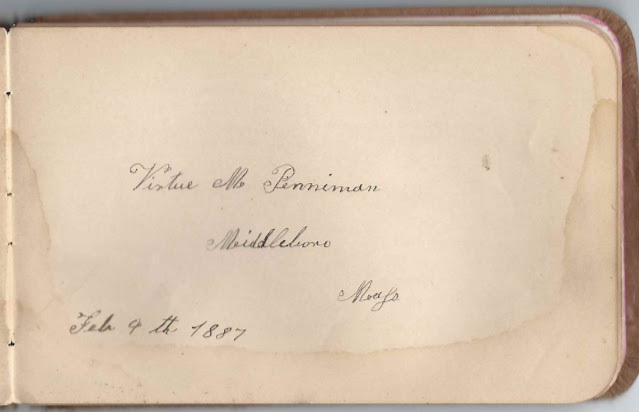 Ellen M. Stone of Samokov, European Turkey, signed at Chelsea, Massachusetts, on September 20, 1878. 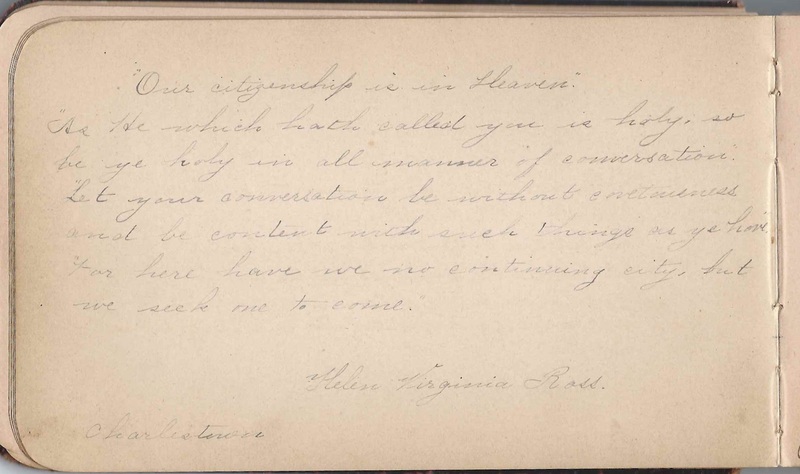 In what some call the first modern hostage crisis, Ellen Maria Stone of Roxbury, Massachusetts, and her pregnant traveling companion were captured in 1901 near Bansko, Bulgaria, and ransomed, through funds raised by the American public, in 1902. As noted in a "Missionary Herald" article in 1906, Ellen was associated with the Collegiate and Theological Institute at Samokov. 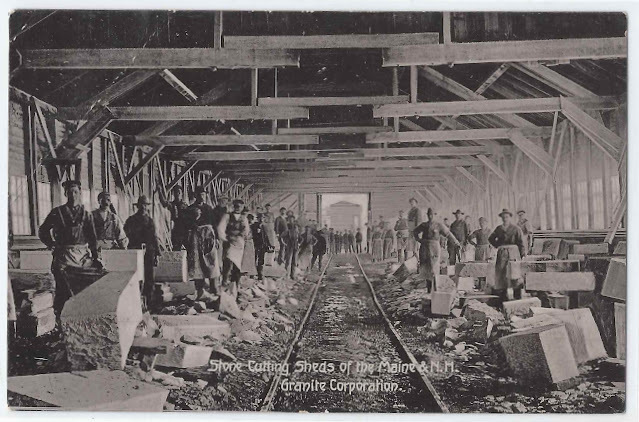 This postcard, mailed from North Jay, Maine, in July 1909, is of interest for two reasons: the subject matter of granite harvesting and cutting in Maine and the message on the reverse from Everett to sister Cynthia S. Lang at Ridlonville, Maine. 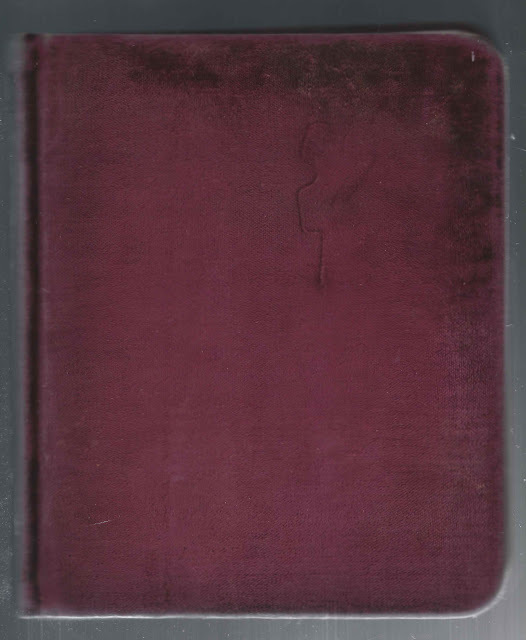 Ridlonville is a village in the town of Mexico, Maine. Read more here about granite mining in North Jay, Maine. Teasing out the identities of brother Everett and sister Cynthia was not as easy as I had first imagined, but that's what makes these journeys of discovery so fascinating. First, I found a marriage record for a Cynthia S. Moulton to an Andrew J. Lang, on 22 November 1896, giving her parents as Daniel and Dorcas (Phinney) Barrett. But I couldn't find a pair of siblings named Everett and Cynthia Barrett. Perhaps Everett was married to one of Cynthia's sisters or to one of Andrew J. Lang's sisters... But I came up empty handed. Then I looked for information on the Mr. Moulton who had been Cynthia's first husband. 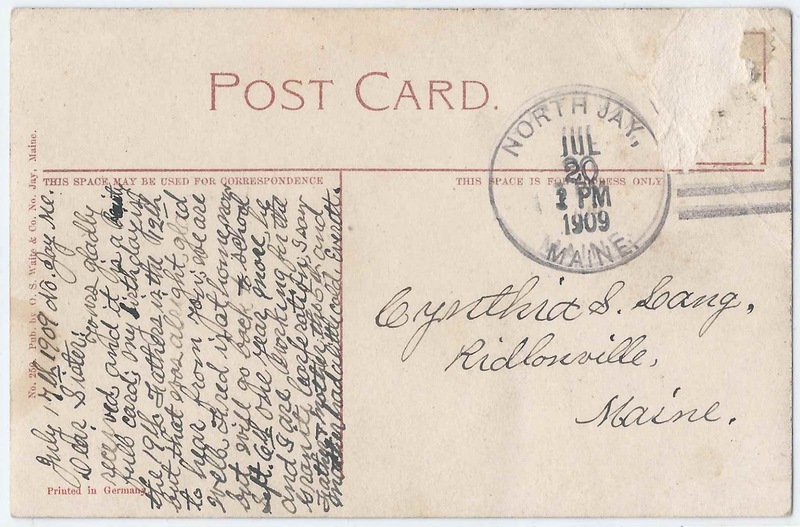 It turns out he was Hartson Moulton; he and Cynthia were married at Carthage, Maine, on 29 March 1887. And it turns out that Hartson Moulton had a brother Everett Orville Moulton! 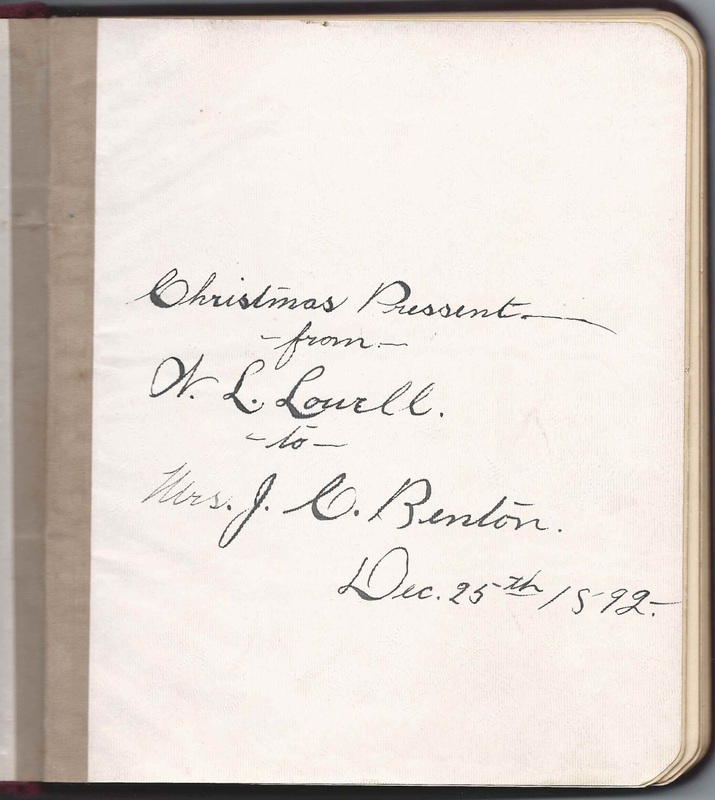 And since Everett was nice enough to include his birth date and his father's in his message, and those dates lined up perfectly with Everett Orville Moulton and his father Albert Moulton, mystery solved! 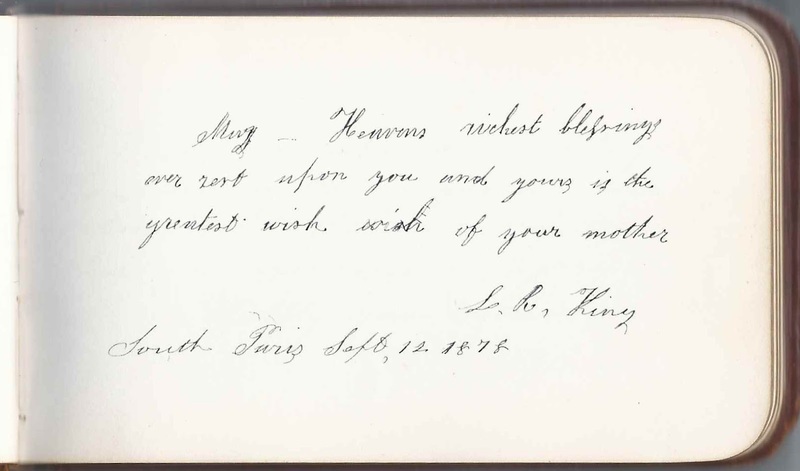 It's nice to know that these two in-laws, Everett O. Moulton and Cynthia Stevens (Barrett) Moulton Lang, kept in touch after Hartson's death in 1893. Cynthia is buried with Hartson Moulton at Newman Cemetery in Franklin County, Maine. 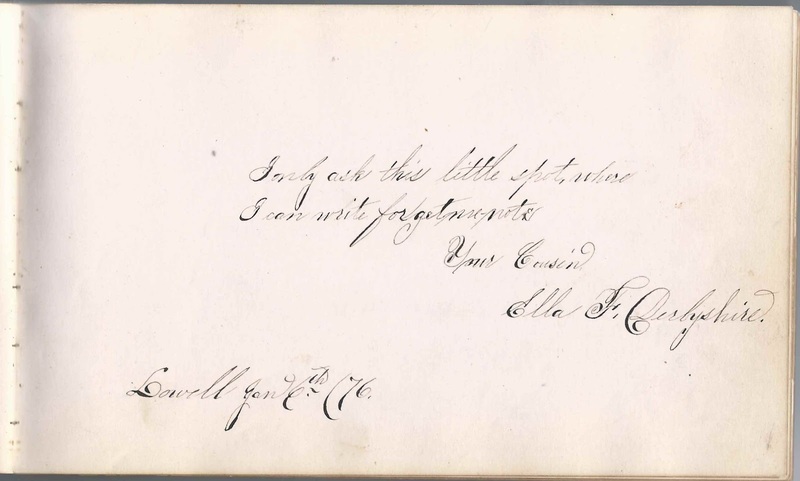 See more information on Cynthia Stevens (Barrett) Moulton Lang; Everett O. Moulton; Hartson Moulton; and Andrew J. Lang, below, after the transcription. July 17th 1909, North Jay, Me. Yours gladly received and it is a beautiful card; my birthday is the 19th, Father's is the 12th but that was alright, glad to hear from you. We are well. 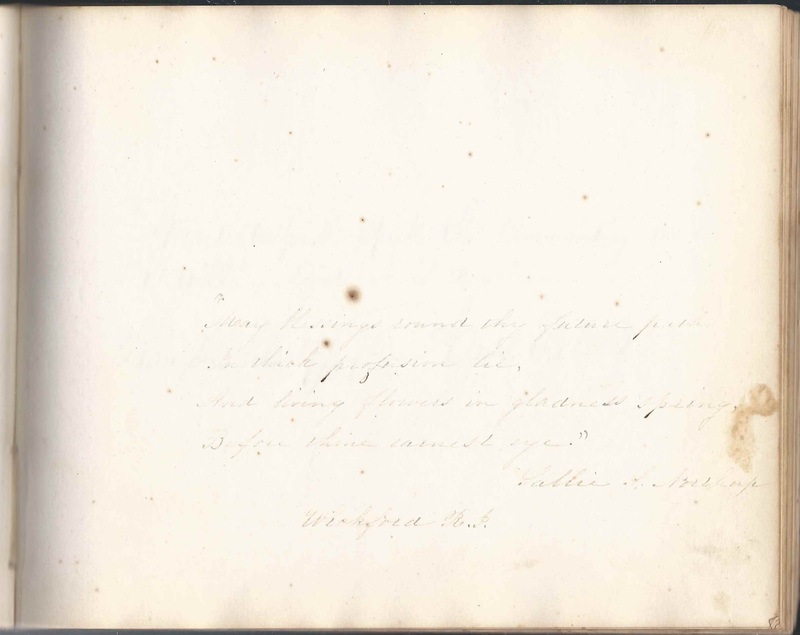 Fred [Fred Hartshorn Moulton, son of the writer, Everett Orville Moulton, and Winifred J. (Hodgkins) Bridden Moulton] is at home now but will go back to school Sept. 6th one year more. He and I are working for the Granite Corporation. I saw Father and Mother the 5th and Mother had a little cold. 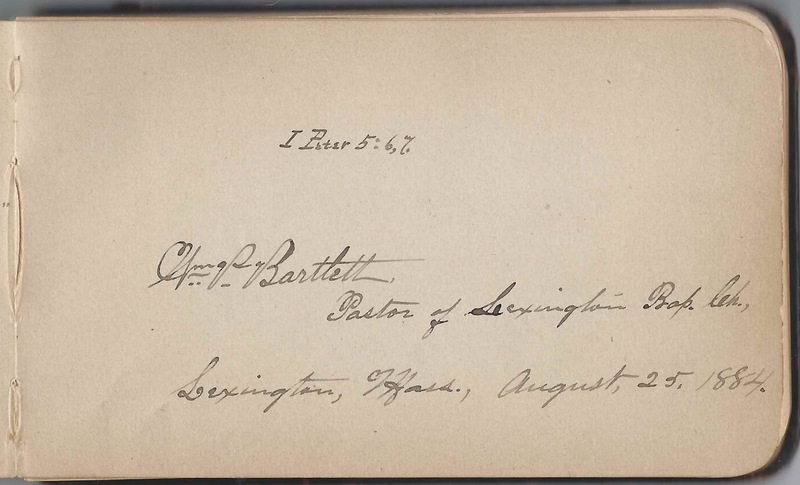 According to her Vermont death record, Cynthia (Stevens) Moulton Lang was born 23 November 1866 at Weld, Maine, the daughter of Daniel and Dorcas (Phinny or Phinney) Barrett. 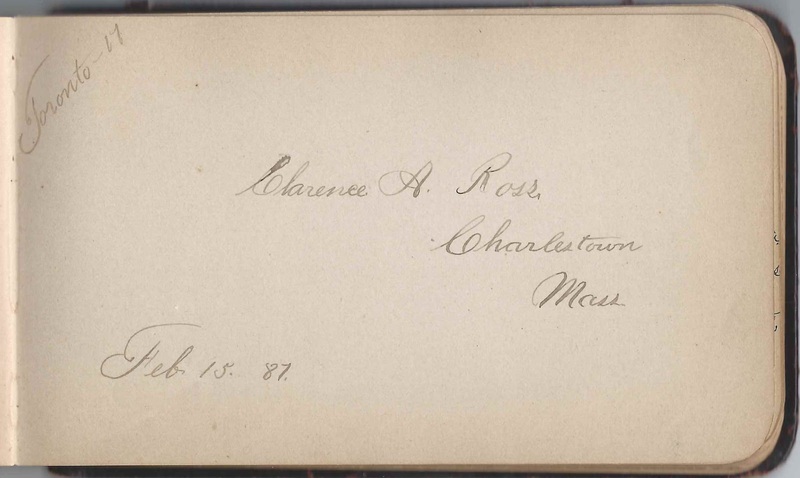 As noted above, she married Hartson Moulton on 29 March 1887 at Carthage, Maine. 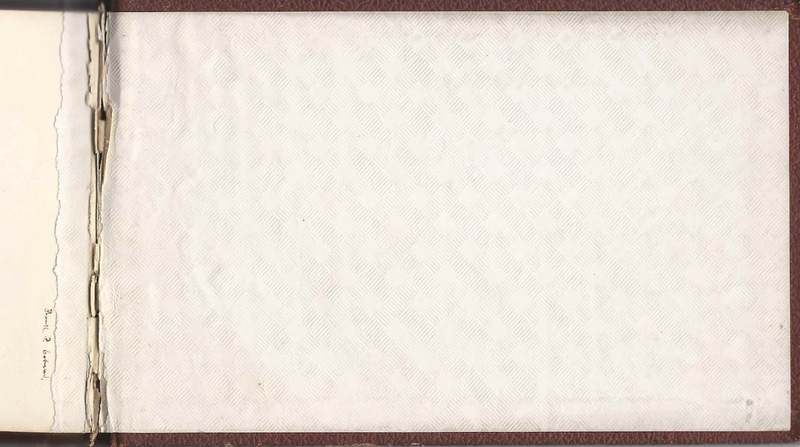 Hartson was born about 1855, the son of Albert and Roxanna Louisa (Pearl) Moulton. 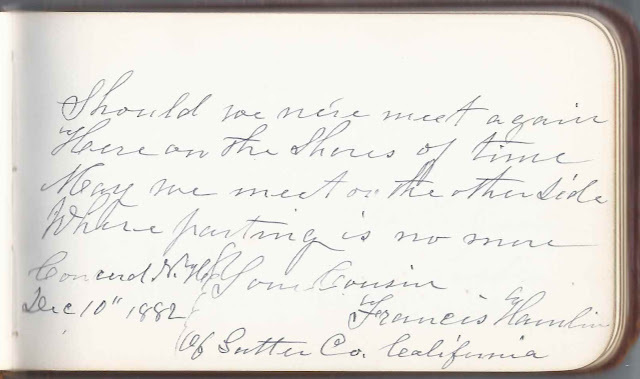 Everett Orville Moulton was his younger brother, born on July 19, 1859, as the message implies. Their father Albert Moulton was born July 12, 1836, again, as the message implies. 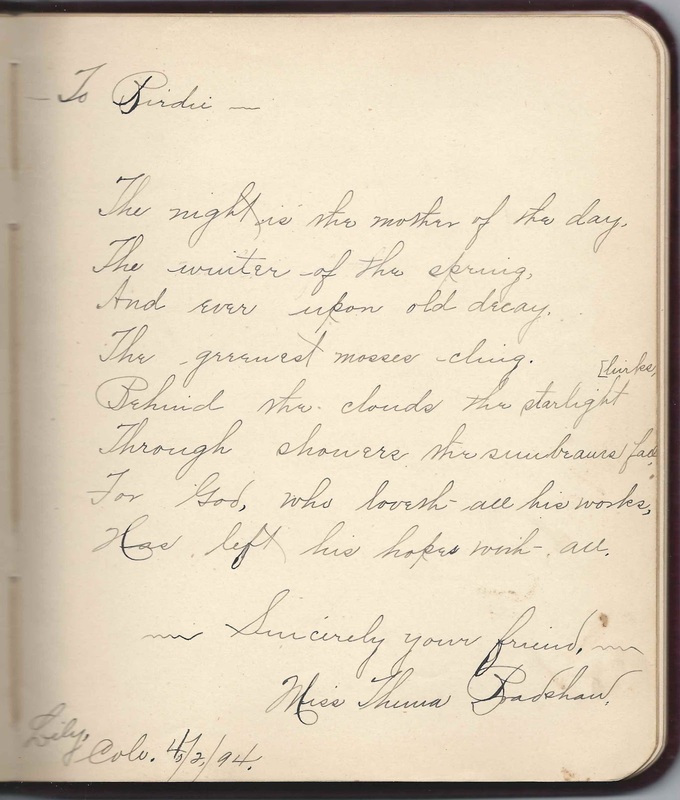 Hartson Moulton died 24 April 1893. On 22 November 1896, Cynthia Stevens (Barrett) Moulton married Andrew J. Lang, son of Andrew Lang, who was born in Scotland. 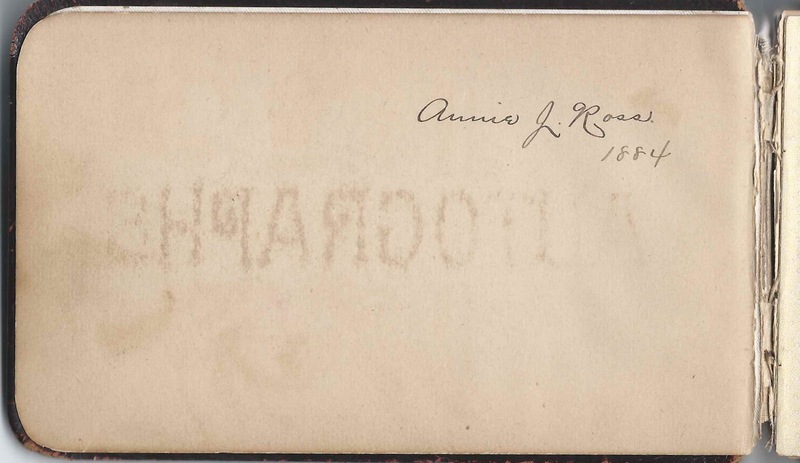 Andrew's mother was born in England, but I can't make out her name on her son's marriage record. Andrew J. Lang's first wife was Helen Newell (Storer) Lang, whom he married 25 December 1881 at Rumford, Maine. 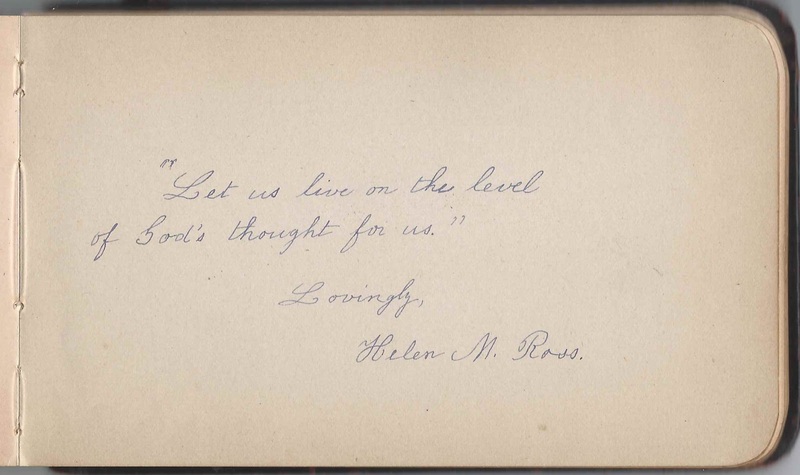 Helen died 20 October 1895 at Dixfield, Maine. 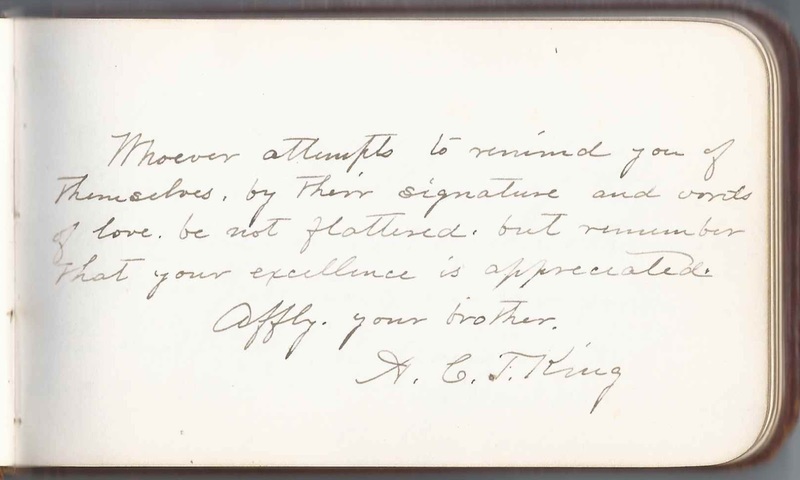 She and Andrew had at least three children together: George F. Lang; Andrew Lucian Lang; and Ethel C. Lang. Cynthia Stevens (Barrett) Moulton Lang and Andrew J. Lang had, I believe, one child, daughter Christina Elizabeth Lang, born 18 August 1898 at Dixfield, Maine. Christina married a Mr. Baker from Rutland, Vermont, and moved there. On 11 January 1952 at Rutland, Vermont, Cynthia Stevens (Barrett) Moulton Lang died of a cerebral thrombosis brought on by a fractured hip. She had presumably moved to Rutland to live with Christina and her family. 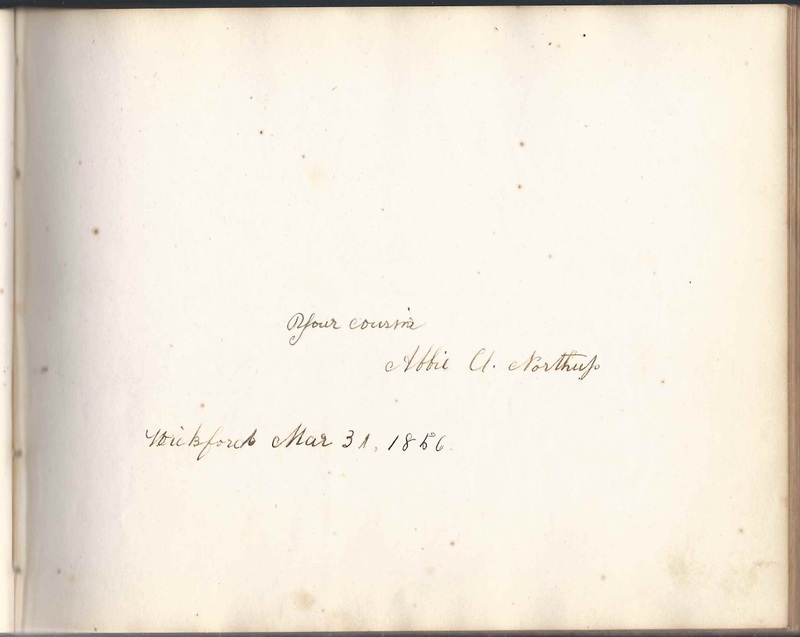 On 29 March 1887 at Cambridge, Massachusetts, Everett Orville Moulton married Minnie (Hodgkins) Bridden, daughter of Aaron and Lucy Hodgkins of Jefferson, Maine, and widow of Benjamin F. Bridden, with whom she had two daughters, Lucy and Winnie. 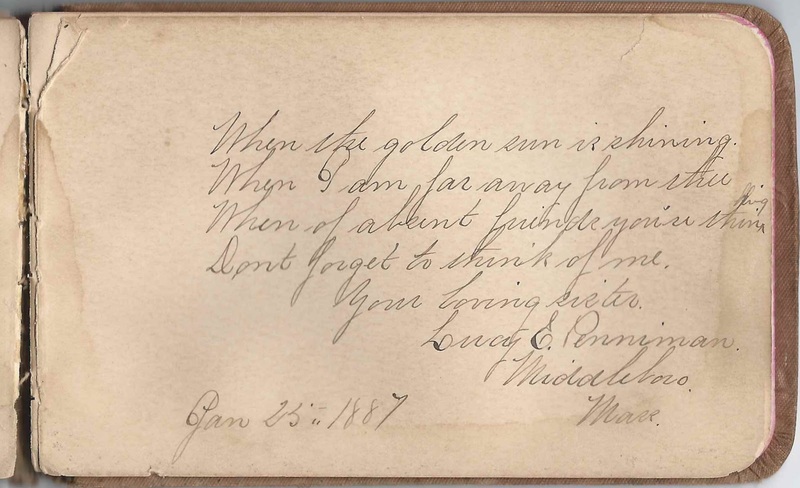 Everett and Winnie would have two sons, Fred Hartshorn Moulton, who is mentioned in the Everett's message to Cynthia, and Amzi Moulton, who died in childhood before the postcard was written. Everett Orville Moulton died in 1912, several years after he sent this postcard. 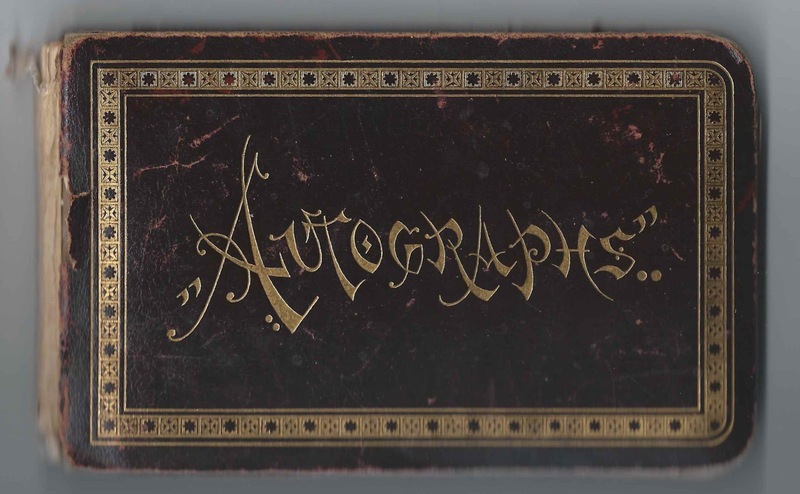 1880s/1890s autograph album of Addie Augusta (Penniman) Bryant of Middleborough, Massachusetts, and Hanson, Massachusetts. The album, which was given to Addie by Minnie H. Bates on December 22, 1886, measures approximately 6" x 3-3/4/" and contains the sentiments of over 50 of Addie's relatives and friends. 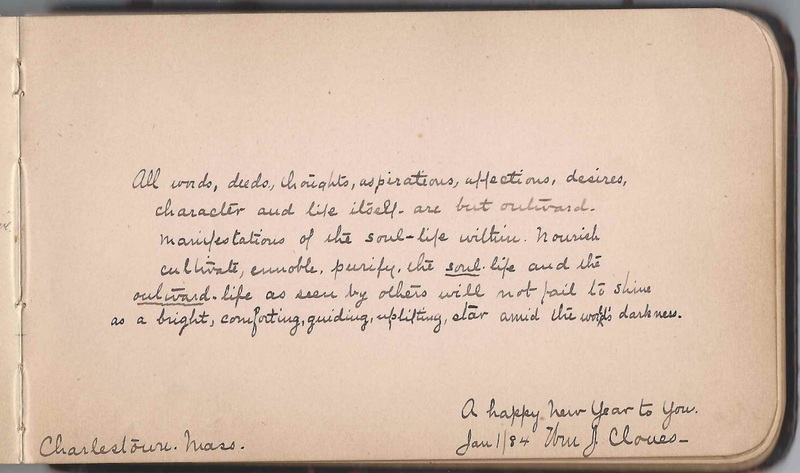 One page was inscribed much later on, by Evelyn Agnes Pike of Salisbury, Massachusetts, in 1926. 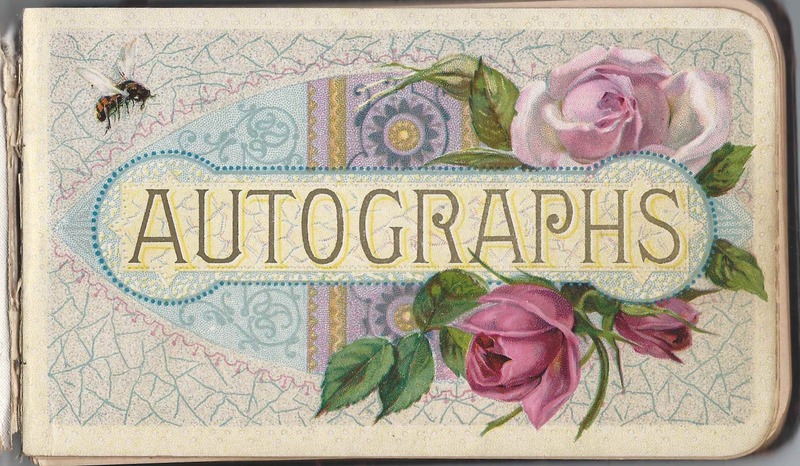 Addie Augusta (Penniman) Bryant was born 17 February 1861 at Middleborough, Massachusetts, the daughter of Prince and Virtue Morton (Freeman) Penniman. 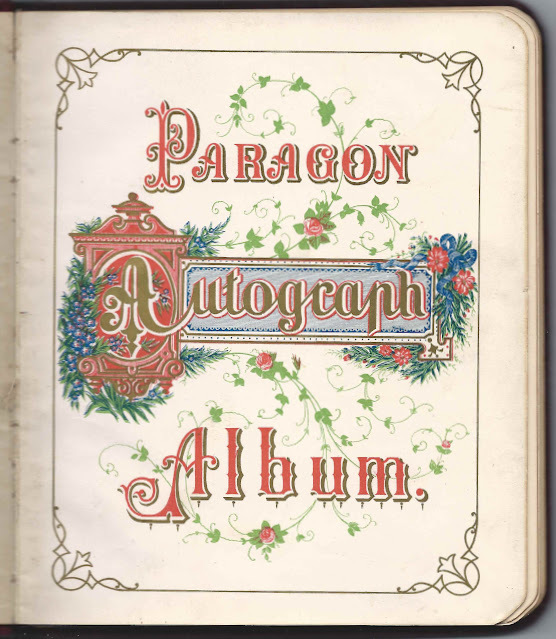 Virtue signed a page in her daughter's album on February 9, 1887. Addie's brother, Josiah F. Penniman of Middleborough, Massachusetts, signed a page on January 31, 1887; it has become detached from the album. 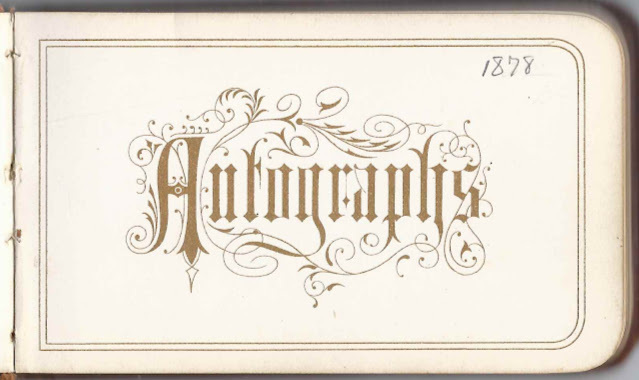 His wife Lucy E. (Burgess) Penniman had signed a page a few days earlier on January 25, 1887. On 7 June 1879, Addie Augusta Penniman married Wallace M. Bryant, son of Henry Edson Bryant and Susan Bennett (Shaw) Bryant. They lived at Hanson, Massachusetts, at least up through the 1930 Census, and had three children, two sons and a daughter. 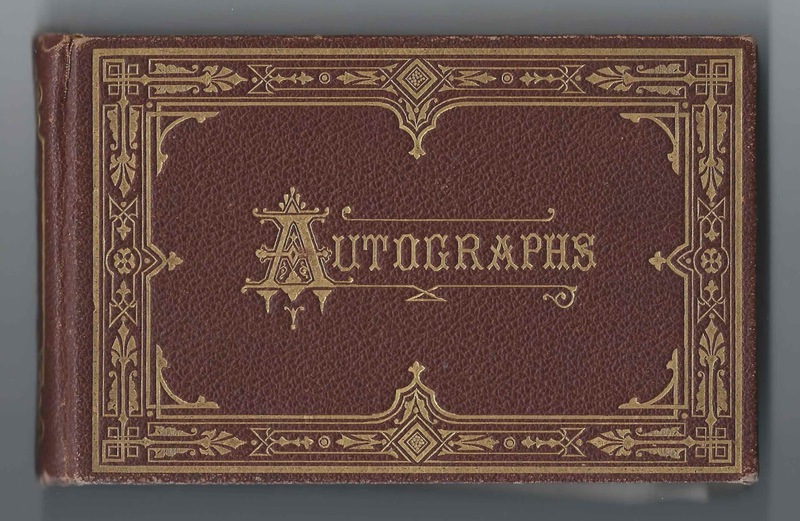 Other members of the Penniman and Bryant and related families also signed pages in the album. Please refer to the list below. If you have corrections and/or additions to the information above, or information on any of the signers listed below, please leave a comment or contact me directly. 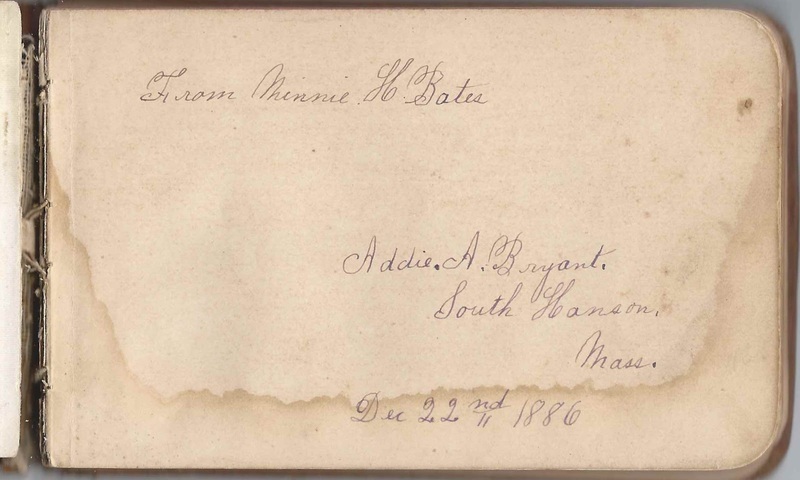 Lillian G. Bryant of South Hanson, Massachusetts, signed on November 25, 1893: "6 years old". She was album owner Addie Augusta (Penniman) Bryant's daughter with husband Theodore Wallace Bryant. 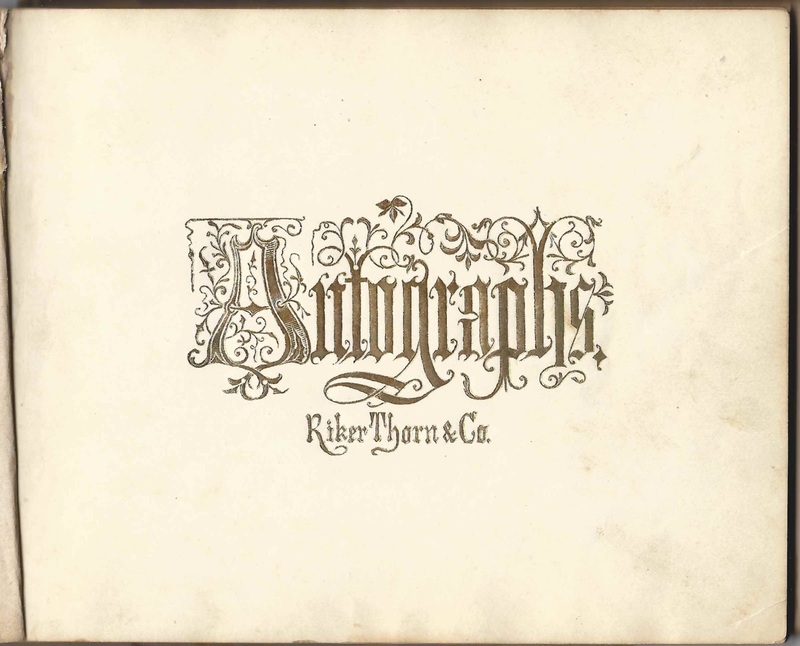 Irvin F. Bryant of South Hanson, Massachusetts, signed on November 25, 1893; "Age 9 years old". 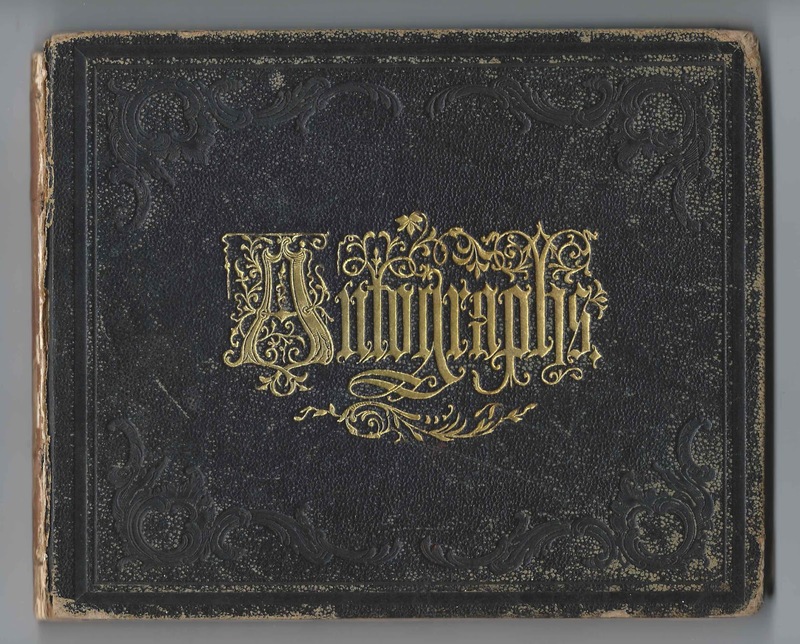 He was album owner Addie Augusta (Penniman) Bryant's son with husband Theodore Wallace Bryant. Virtue M. Penniman of Middleborough, Massachusetts, signed on Febrary 9, 1887. She was Virtue Morton (Freeman) Penniman, Addie's mother. 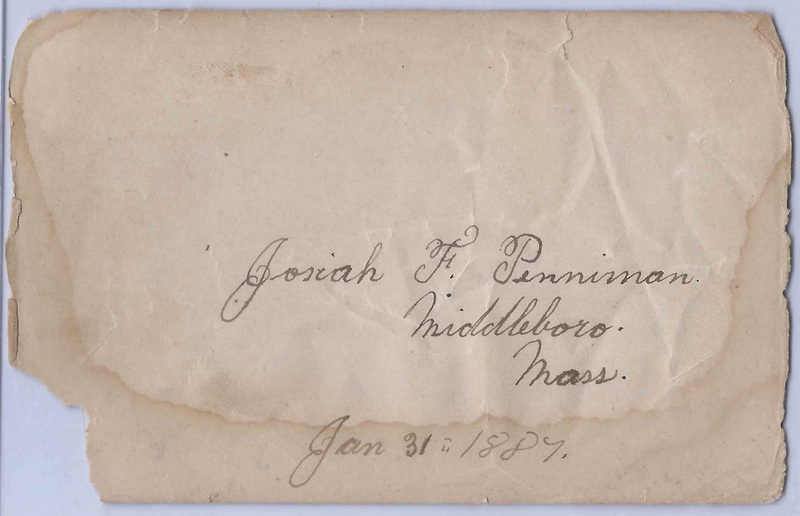 C. Addie Penniman of Middleboro, Massachusetts, signed on January 12, 1887. She Cynthia Abbie (Phinney) Penniman, wife of Jules Foster Penniman, who was Addie's brother. 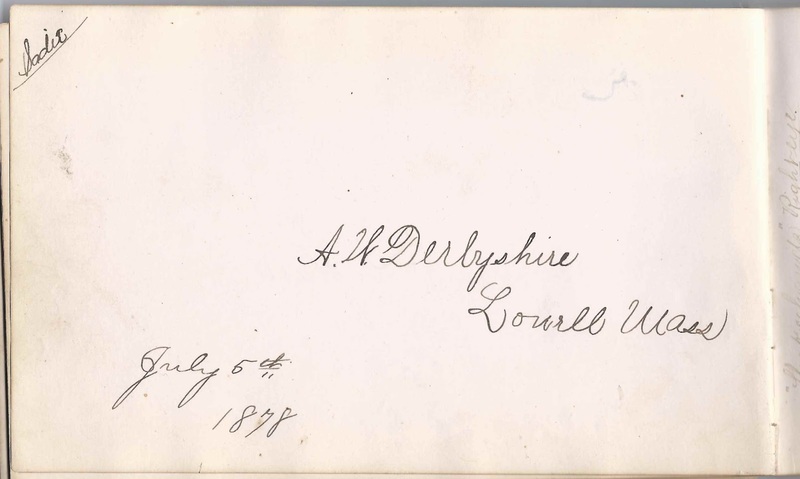 Evelyn Agnes Pike of Salisbury, Massachusetts, signed on " '02-10-26"